Enjoyed working with Thomas from the original plans, revisions and installation. The cabinet from plans to installation was completed on time and on budget, which is unusual in today environment. Thomas came back after 2 weeks to make sure that all was conforming with what he had promised and to make a few adjustments that were needed to the cabinet doors after all had settled. I would hire Thomas and his “INNOVATIVE” company again for any future cabinet needs. Thank you Thomas; we need more of your type of company and work!!! I’m super pleased with my new cabinet. It’s awesome! Tom Cook was professional and friendly. I would recommend him to all my friends and family. He did a great job installing our cabinets. I couldn’t be more pleased with their product. I now have extra room for my linens. It was a fast installation and quick clean up, which I do appreciate. the opportunity to do again! timely. 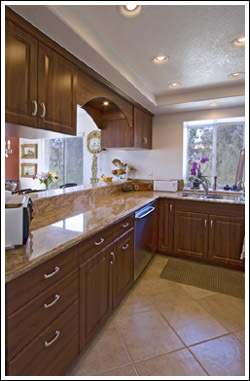 The work included complete demolition and remodel of our kitchen. leak within our laundry room that they fixed and repaired for us. I have had the pleasure of working with We’re Innovative for the past four years. Our firm has been very impressed with We’re Innovative’s superior quality of work, and the integrity and professionalism of their employees. We’re Innovative has met every challenge we have sent their way with courtesy, efficiency and the experience necessary to successfully complete their tasks. This company possesses the skills needed to successfully compete in today’s market. I highly recommend We’re Innovative as one of San Diego’s finest millwork shops. They are capable, thorough, and completely trustworthy. It’s a testament to your crew and I would love it if you would personally thank them (the line guys too!!) for us. I can go into load in/change over monday with a completed and working kitchen, and a delay of even three days would have prevented that. Again, thank you. Tom, We are very pleased with the remodel of our two bathrooms. Everything we planned, colors, lighting, custom cabinets, counter tops, sinks, toilets, Jacuzzi tub, shower, pocket doors and hardware came together and created the dream baths we had hoped for. Our remodel required gutting two bathrooms and changing a bathroom with a shower into a Jacuzzi tub and a bathroom with bath tub into a shower. Because of this, we greatly appreciated working with you to improve on our initial designs and your suggestions of more cost effective ways to implement them. We also appreciated your willingness and ability to follow through with various changes we made as the job progressed. We were always pleased to see your employees arrive, as they were all about doing the best for us each day. They came to the job clean and ready to work with a positive attitude. 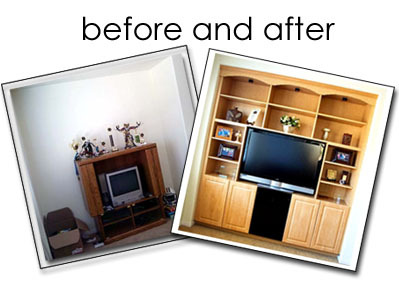 They are highly skilled professionals and they were always accommodating, in working with us to meet our needs. We kind of miss seeing them now that the job is completed. It was a pleasure to have you and your employees remodel our bathrooms. You were truly Innovative in meeting our remodel design needs. 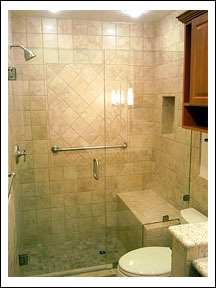 We highly recommend your company, We’re Innovative, for all remodeling. Often you hear people say that it is now difficult to get good workers. I wanted to share with you how pleased I was with your workers, your guidance, and the entire remodel project. I had considered redoing my miserable old kitchen for a couple of years. The cupboard paint was very worn and the shelving was fixed, and if the bottle or box was too tall there was no option. A couple of months before meeting you I had done all my homework and interviewed several contractors. I had considered all possible combinations of remodeling of the kitchen – just painting or refacing, or new cupboards, and no new counter tops, or laminate tops, composite tops, or finally granite. After having the opportunity to discuss some of my specific and some vague ideas with you and hearing your input, and seeing samples, I felt that you were the person that I could trust to do a good job. I realized that doing any combination of the partial options previously considered would not achieve a pretty and workable kitchen and collectively would have been expensive. After all, one doesn’t do a major remodel of the kitchen often. Being without a kitchen has its surprising inconveniences, having the renovation – actually a whole new kitchen – complete a week ahead of schedule was terrific.